No, you cannot see him. He loves you more than ever. to the loneliest of days. He faced and won complete. to rest you on his chest. He's been through it all before. to my Jesus who already knows your name. let him hold your face. even the loneliest of place. Kayla, you write such beautiful poems! What a talent you have. Blessed to have read this. Crystal, I am flattered! Thank you! In truth, this is the first poem that I have written in FOREVER so I am super encouraged by your sweet note! Thank you for this post, sometimes we feel lonely in the midst of a crowd or a marriage. Thank you for this for us to embrace in times of loneliness. What a lovely poem. Thank you so much for sharing your thoughts and heart with us at Sitting Among Friends on Wednesdays. I hope we see you again this week! Thank you Jaime, I was honored to join in! This is a beautiful, true poem...full of comfort. So beautifully written. :) Absolutely loved it! so many feelings! <3 love the truth in this letter! 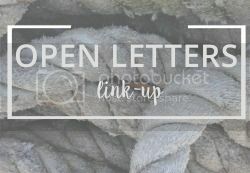 I am so thrilled that you added this to the Open Letters Link-up. What rich biblical truth in such a heartfelt poem! And so creative. In the line "rest you on his chest," I pictured how I bring my sleeping 3-month-old to rest on my chest. What a comfort to know that Jesus is there to hold us close when we are lonely. This is beautiful! Thank you for this! Thank you, Julie! That was exactly what I was picturing when that line developed! <3 Absolutely!! !